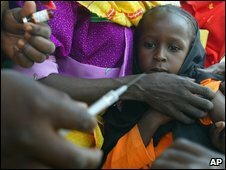 An operations has started to vaccinate some 20 million children in West Africa over the next month in a major effort to eradicate polio. Hundreds of thousands of volunteers have been mobilised in eight countries to help administer the oral vaccine. The UN Children's Fund is working with the World Health Organisation and various health ministries to try to rid Africa of the incurable virus. It spreads easily in densely populated countries with poor sanitation. The operation has started in Ghana, where almost five million children are to be immunised in three days. Seven other countries are to follow suit this month. BBC West Africa correspondent Will Ross says great strides have been made in the fight against polo in recent years. But the virus which causes paralysis has not been eradicated in West Africa partly because previous efforts at vaccination have been met with suspicion by some religious leaders in Nigeria. The battle against polio received a major set-back in 2003 when a vaccination programme in northern Nigeria had to be abandoned after rumours spread that the polio vaccine caused Aids and was part of a western plot to sterilise Muslim girls. As a result the virus then spread and re-infected 23 countries which had earlier been declared polio free. Ghana had recorded no new cases of polio for five years until just a few months ago when eight cases were identified - the children between the ages and one and four were all paralysed. The ongoing effort to eradicate polio is not cheap - in Ghana alone $2.5m (£1.7m) will be spent over the next three days.